F4 active in Northern India on Thursday, as the hill states experienced snowfall at many places with heavy sleet forcing closure of Jammu-Srinagar National Highway, and snowfall on the higher reaches of Pir Panjal mountain range since Wednesday night. Qazigund received 3 cm of snow, while Gulmarg recorded around 2 cm of snow. Higher reaches of Himachal Pradesh witnessed snowfall at many places, including Manali and Shimla. Manali received 2 cm of fresh snow, while Shimla experienced 5 cm of snowfall on Wednesday night and the lower hills received intermittent showers, with Saloni and Kumarsain receiving 10 mm of rains. High altitude Kinnaur and Lahaul and Spiti districts also were covered by thick white blanket. Rain and snow also occurred at isolated places in Uttaranchal. In Delhi, it was a pleasant day with the mercury just below the normal level at 24c in the day. Pakistan too had its share from F4 today, with the NWFP and Northern regions of Punjab getting rains and snow in the extreme North. Dir recorded the highest of 44 mms of rain. Islamabad had 6 mms of rain with the temperature in the 20 - 6 range. Kathmandu has again warmed up to 27.5c, very high for this time of the month. Prompts me to forecast some effect of F4 in the city on Friday/Saturday. UAC-2 smittered some rains in S.Maharashtra with Sangli recording 3 cms and Ahmadnagar getting 1 cms. Aurangabad and Marathwada cities received light rains. It now seems that the UAC has moved Northwards, into N. Mah region. The image put up (above) shows this development. But, actual clouding associated with it is in the East of the system,and apparently less than yesterday. seen stretching from M.P. thru interior Mah. thru interior Karnataka into Kerala. very prominently seen in this sat. image from Dundee @ 11.30 pmIST.on Wednesday. 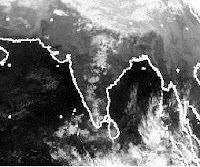 Friday: Light to medium rains all along the line of wind discontinuity right upto Kerala, as seen today. And fairly active F4, though, while moving away from Pakistan, restricted to Northern Indian regions and Western Nepal. Saturday: Line of rainfall across India moves a bit Eastwards, and weakens. F4 weakening and concentrating on Utteranchal and western Nepal. Not Much effects on Mumbai. 25% clouding (2 OKTA) on Friday/Saturday with 31c as the high and 21c the other extreme. Cooling to some extent expected from Saturday (F4 effect). it's really possible that downtown San Francisco might see its first snowfall in more than 30 years later this week. "If we do experience snow, you may see it in the air, but it will likely be gone before it hits the ground," Benjamin, a weather service forecaster in Monterey, said. However, the snow could likely stick to metal surfaces up in San Francisco's Twin Peaks, as well as the Hills in neighboring Oakland, he added. A major threat of dangerous thunderstorms, including the risk of tornadoes, today from Texas to Tennessee has AccuWeather.com meteorologists concerned this could be the first significant severe outbreak of 2011. The area of greatest concern lies from the Arkansas-Louisiana border into northern Mississippi, western Tennessee and extreme southeastern Missouri and southwestern Kentucky late this afternoon into tonight. nt, a surprising forecast indeed.. of hail ! and Sahar does not show a similar forecast on the same site. some models show very isolated rains in the N.Mah. region on Monday. Some others are clear of any rains in this area. True Rajesh, the CNN weather forecast model is clear of any rains in the Mumbai or North Maha region, the IMD too is for Dry weather. Don't know how BBC made this forecast. I never give much attention to BBC forecast. When it comes to my city, they always seem to be off by quite a few degrees. And their prediction of rain is seldom correct.